, or Valeriano Bolzam, an ingenious and learned Italian, was born at Belluno, in the state of Venice, about 1477. 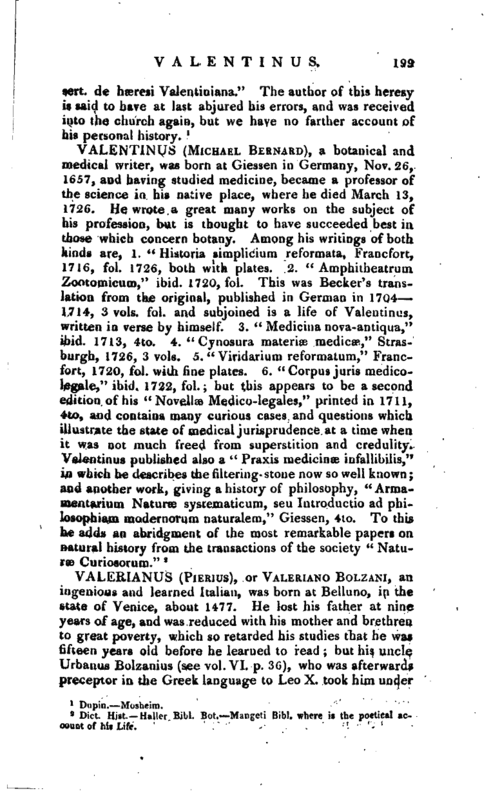 He lost his father at nine years of age, and was reduced with his mother and brethren to great poverty, which so retarded his studies that he was fifteen years old before he learned to read; but his uncle Urbanus Bolzanius (see vol. VI. p. 36), who was afterwards preceptor in the Greek language to Leo X. took him under | his protection, and had him liberally educated. He studied the Latin and Greek tongues under Valla and Lascaris; and made so wonderful a progress, that he was accounted one of the most learned men of his age. Going to Rome under the pontificate of Julius II. he became the favourite of John de Medicis (afterwards Leo X. ), who committed to his care the conduct and instruction of two nephews; and the cardinal Julius de Medicis, who entered upon the pontificate in 1523, under the name of Clement VII. shewed him the same regard. 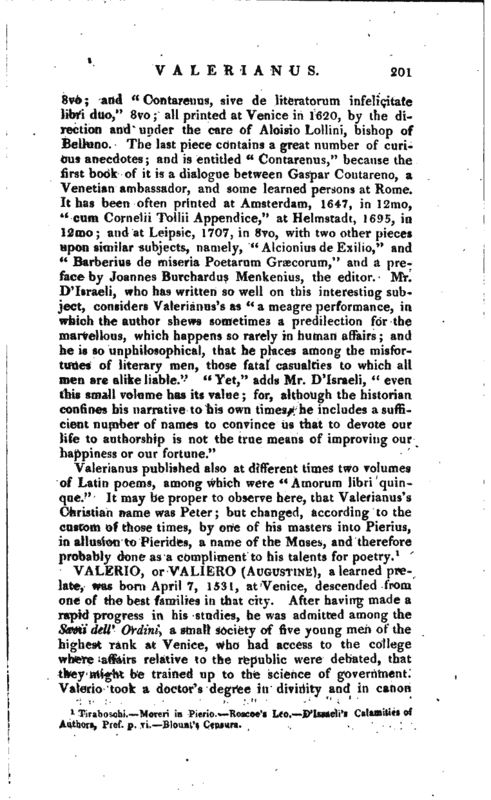 He offered him first the bishopric of Justinople, and then that of Avignon; but Valerianus refused them both, being fully satisfied with the place of apostolic notary. He was in imminent danger, when Rome was taken in 1527; and the year after retired to Belluno, for the sake of that tranquillity which he had never found at court. Yet he suffered himself to be drawn from his retirement by Hypolite de Medicis, one of his pupils; who, being made a cardinal in 1529, chose him for his secretary. He continued in this office till the death of the cardinal in 1535; and seems to have passed the next two years with his other pupil Alexander de Medicis, who had been made first duke of Florence in 1531. 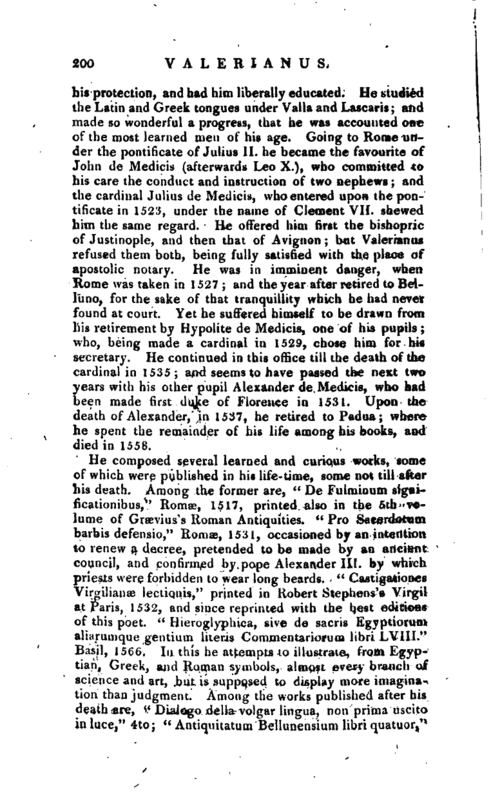 Upon the death of Alexander, in 1537, he retired to Padua; where he spent the remainder of his life among his books, and died in 1558. 1 Tiraboschi.—Moreri in Pierio. Rescue’s Leo. D‘Israeli’s Calamities of Authors, Pref. p. ri. Blounl’t Censura.